The Caddis Fly Angling Shop’s 11th annual Two Fly Tournament kicks off this Friday. In the shop today 10% of sales will go to The McKenzie River Trust. Over the years the tournament has raised over $80,0000 for the trust. This year we have some fantastic sponsorships from Patagonia, Richardson Caps, North Fork Public House and Koffler Boats. We have had prizes donated by Echo Rods and Costa Sunglasses. Please stop by and stock up today for a good cause. We have a full array of must have fall flies, new fall Patagonia shirts and jackets in stock along with all the rest of your fall fishing and fly tying needs. Tonights festivities include Hideaway Bakery’s wood fired oven pizza and Oakshire Brew. Tonight, teams will draw guide assignments and strategies for Saturday fishing will be made. Each boat will be looking for the best three fish total length score of rainbow and cutthroat trout. Each angler is allowed to score with two flies. Stay Tuned for this years results! 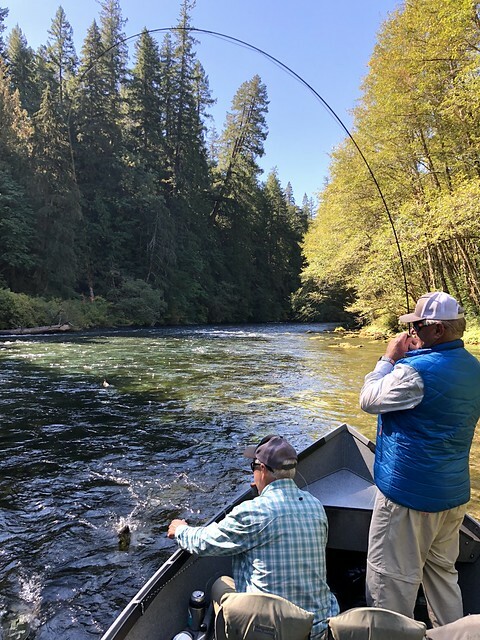 This entry was posted in Fly Fishing Contests, McKenzie River, Oregon Conservation News, Shop Sales and Specials. Bookmark the permalink.